"Getting acknowledged for our work by K-pop fans in both Bulgaria and elsewhere is the best gift I've ever received," said Bojana Doneva, who runs a Sophi-based radio show, "Friday Chopsticks," that introduces Korean pop music, TV shows and movies to fans across Bulgaria and elsewhere in the K-blogosphere. Doneva, who talks about Korean pop culture on her radio every Friday, stresses that one of the reasons why Korea is so attractive to people all around the world is that the Korean people treat the elderly with respect. Diana Trifonova said, "I was the only one who had some experience broadcasting when we first started the program, so I've served as the show's editor. I'm also shooting photos and videos for our YouTube channel." Starting with the radio broadcast, they're now introducing all things Korea through a variety of social media, like YouTube, Facebook, Instagram and Twitter. They are also write articles for Korea.net as honorary reporters, to get more information about Korean pop and to communicate with fans all over. 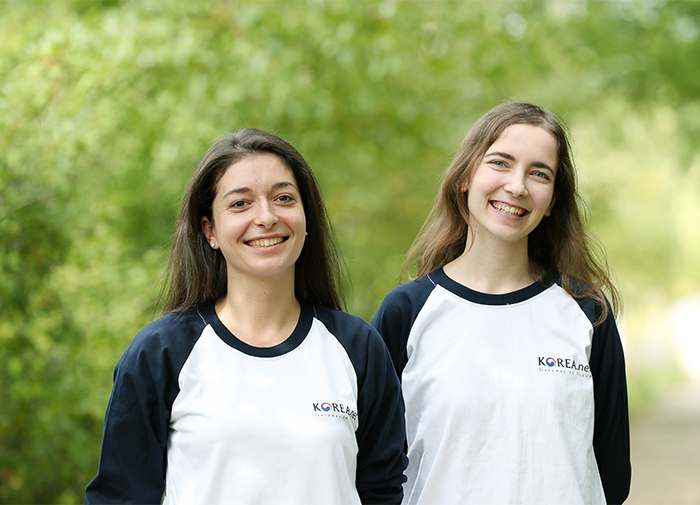 Diana Trifonova (left) and Bojana Doneva deliver vivid news about Korea on their radio show in Bulgaria.